By Alan Green in VectorVest on 5th July 2017 . Plus500 Ltd, (PLUS.L), formerly Investsoft Ltd., is an Israel-based company, which develops and operates online trading platforms for retail customers to trade contracts for difference (CFDs) internationally over more than 1,700 different underlying global financial instruments, comprising equities, exchange traded funds (ETF), foreign exchange, indices and commodities. The Company offers its service to retail customers in more than 50 countries via platforms across multiple internet and mobile operating systems. 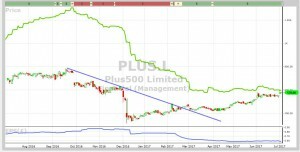 PLUS started appearing across key VectorVest metrics in December 2016, when the shares traded around 320p. While the well-documented regulatory challenges with financial authorities around the globe still sees a low RS (Relative Safety) rating of just 0.83 – poor on a scale of 0.00 to 2.00, the rate of recovery since the beginning of the year has seen the stock hit our current Value target of 578p per share for PLUS, indicating that at 596p it is currently fully. This only tells part of the story though: the RT (Relative Timing) indicator,which is a fast, smart, accurate indicator of a stock’s price trend, shows a rating of 1.55 for PLUS, which is excellent on a scale of 0.00 to 2.00. The chart of Plus 500 is shown above where the share is on a VectorVest BUY recommendation. Over the past month the share has charted a triangular consolidation pattern and has gapped upwards out of the consolidation over the past two trading days. This gap (breakaway gap) usually precedes a strong move. Those holding the share should sit tight and consider adding to a winning position. Summary: Since our April 26th note, PLUS has made dramatic progress from 468p and has hit our valuation of 578p. We repeat the view that PLUS has emerged from its not inconsiderable regulatory challenges in fine shape, and with an extremely bullish forecast for full year numbers. The valuation gap has now closed, but with the trend very much a friend in this case, the RT indicator shows that further progress from this point is likely. Aggressive traders who have experience in managing risk proactively should carefully consider this opportunity when they observe that the general market is positive. 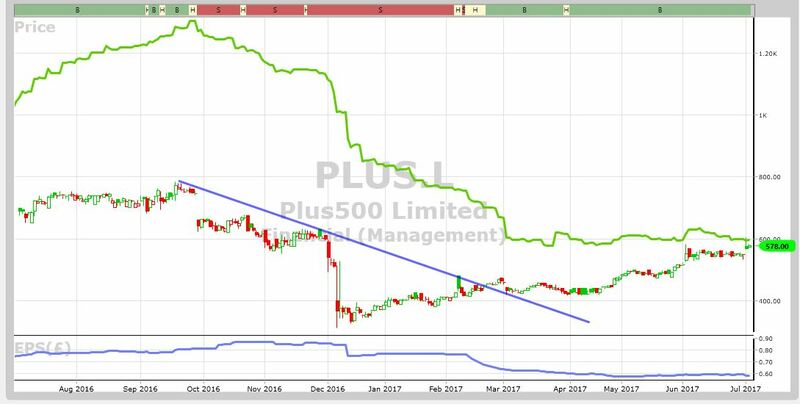 Readers can examine trading opportunities on PLUS and a host of other similar stocks for a single payment of £5.95. This gives access to the VectorVest Risk Free 5-week trial, where members enjoy unlimited access to VectorVest UK & U.S., plus VectorVest University for on-demand strategies and training. Link here to view.